“Wherever you go, whatever you do, I will be right here waiting for you”…by Richard Marx…. That’s the kind of music that most Vietnamese people like. I am sure most foreigners would think all of these songs are crap and middle of the road but ……. You’d be surprised that, whoever you talk to, all of them know this music. They all love Mariah Carey, Whitney Houston and Celine Dion, even ZZ TOP. And, of course, I like these singers too. Maybe we are very sentimental or maybe these songs are easy to listen to and can be remembered after a few times. Do not be surprised when Vietnamese ask you who are Fleet wood Mac, Dire Straits or Moby. But they know lots about Elton John, Phil Collins and many more….. You might wonder about their musical taste and I have wondered myself many times about that too. I realized that listening to such songs is the easiest way for us in general to study English. Another reason is that all the words are very simple and can be written down. Maybe you think we are very romantic in our musical taste but that’s just the way it is. Nowadays, there are lots of young people who like rock, rap and hip hop, but that’s not a high percentage of the whole population. Hope this short message can help you avoid rolling your eyes whenever you asked a Vietnamese person who their favourite singer is. Just smile and say that’s NICE. I went to the market and bought some chicken and some veggies. The lady said to me chicken is very expensive today because of bird flu from the south. I said, it should be cheaper now than before but she didn’t agree. I walked away but I heard some other girls saying that my accent was not local or that I was a Viet Kieu (people who live abroad). I went back to her shop and bought the chicken at her price and went to another shop to check the weight and it was out by almost 200 grams. I went back to her and told her about the missing 200 grams and she tried to argue the point. I pointed right at her face and said to her: “I’ve bought chicken from you before and you’ve tried to rip me off today and I’ve decided to buy from you again but I want to let everybody know that you are a rip off merchant.” Then I walked away. Every body laughed and I didn’t think I would do that. I was surprised at myself about that. I walked out of the market a little fearful and wondered if she was chasing me with a knife. Anyway, I’ll never go back to her stall again. Isn’t that strange for a guy who never usually says a word, who normally just ignores and walks away? Life in Hanoi for me as a southern Vietnamese is totally different. Maybe I am not very adaptable guy. Hanoians are so polite and nice. Southern people are too but in a different way. I have been living in Hanoi for 3 years so far but sometimes they drive me crazy. They act like they don’t understand what I say or they try to rip me off all the time. And my staff always teases me by mimicking my accent. Food in Hanoi is very good, but I dislike a very small but very important thing is their recipes- they are always put too much Japanese stuff called MSG (Mi` chi’nh) which I hate!!! 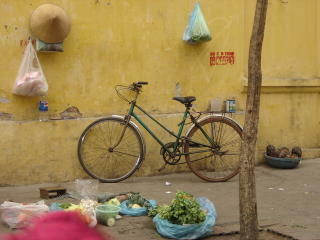 Hanoi’s a very interesting city with heaps of places to go but not for the night life. There are lots of good restaurants in Hanoi, but the best food here is on the street. I’m not talking about the price. The quality is just different. Eat on the street if you really want to try Vietnamese food.